If you wonder what's with the title, let me enlighten you! I have another post with similar name Rivers of lying purple, I've called it like that because when I did that water marble I've used a dark brown that turned purple in the water..cool huh? So I thought let's continue the tradition because my skills at this technique are pretty bad and my nails don't look alike, they just seem like rivers of colors randomly flowing on my nails haha. So until I succeed in doing the same water marble on my nails this is how I'm gonna name them. For my simple nails I've used Rimmel London -Apricot Punch (#53) it has a nice sweet smell I think. Underneath the water marble I have a white base and for the water marble itself I've used Farmec #363, Astor #138, Golden Rose #95 and the Apricot punch again (I love the name :))). For my glittery fingers I've used Golden Rose #112. Watermable :x de cand nu am mai facut asa:D... ti-au iesit impecabile , si nuantele le-ai combinat asa frumos! Oh, sunt adorabile! Imi plac mult de tot si parca ma tenteaza sa mai incerc o data water marble...desi sunt sigura ca va fi un dezastru :)) tie ti-a iesit super bine :* bravo! Ce frumos arata! Imi place extrem de mult ca ai folosit water marble. MAnichiura in apa ti-a iesit absolut superbbbbb. Bravo. PUP. Such a pretty mani!! I absolutely love the orange polish!! Cat imi place oja d ela Rimmel!! Foarte frumoasa manichiura! 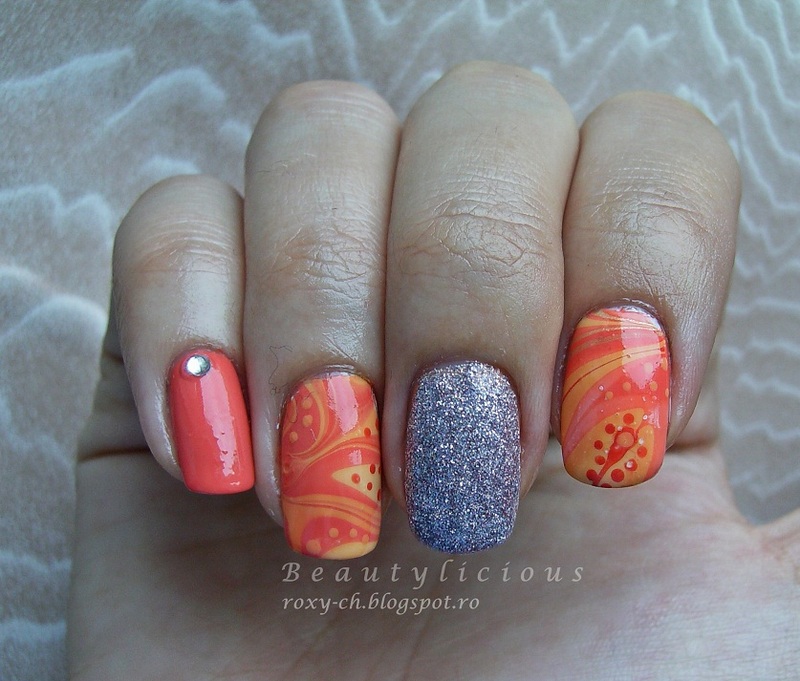 That's a gorgeous mani, I really love it!